A combination of Shattuckite, Dioptase, Malachite and Chrysocolla on Smokey Quartz from Namibia. When Quantum Quattro is used for mediation, it may enhance visualisation of positive changes in one’s desired life. Psychologically, Quantum Quattro is said to be particularly effective at healing the effects of grief and letting go of heartache. Believed to Support a positive attitude to life and instilling the ability to tune into one’s resources, Quantum Quattro is said to be especially helpful when you do know what to do next, as it may indicate direction. 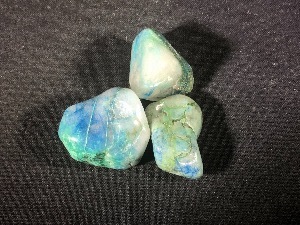 Emotionally, Quantum Quattro is said to be a powerful healer for the heart and activator for the higher heart chakra. Healing, Quantum Quattro is said to be a master healer; brings the body gently back into balance and acts as a general tonic. Quantum Quattro tumbled to a smooth finish, an ideal pocket size stone, small enough to carry around with you. Tumble Stones can also be placed around the home for their energies or can just be nice decorative items. 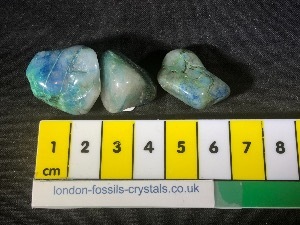 Quantum Quattro crystal gemstones of varying sizes selected specially for your order.